It's so easy to buy a good portable digital recorder these days, but once you have such a device the next issue is getting a good set of microphones. The topic of mics is significantly more complicated, since there are thousands of possibilities and numerous related technical issues. What types of microphones are there? Which are optimal for which tasks? What connectors do you need? Does the microphone require power and how do you provide this? In this article I will start to address these questions, assuming limited knowledge. Though this series is only a primer, it will give you a head start on understanding the more detailed information available all over the web. In the first blog entry I will review my articles on choosing an audio recorder, and then discuss certain limitations of the built-in mics. In the second part I will define different types of microphones, and discuss their power requirements. In the third article I will examine several common recording tasks and discuss the most appropriate microphones for each. The first thing I should do is point you to my previous articles on the recorders themselves. While I haven't kept up with every new model, the pace of technology has slowed in this area. So these shouldn't be too far out of date. All of the popular smaller recorders from this list have a pair of microphones built-in. Larger units might not, since they assume more experienced recordists who already know which microphones they need (and likely already own them). Summary of Portable Digital Audio Recorders has been updated through 2012 (2009.11.08). Which Portable Digital Audio Recorder? garnered 30 comments (2009.11.10). Choosing An Audio Recorder For Ultimate Sound Quality -- which likely means it won't have a microphone (2009.11.12). Sony PCM-M10 versus Olympus LS-10 / LS-11 compares my two favourite small units and spawned one of my most popular threads (2010.04.26). Revisiting the Sony PCM-M10 versus Olympus LS-10 / LS-11 Discussion also has 60 comments (2010.09.16). 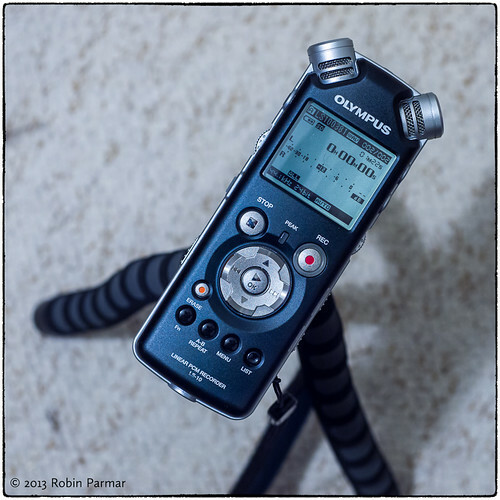 Sony PCM-M10 and Olympus LS-10 Sound Examples so you can use your ears to help decide (2010.12.15). Are The Built-In Microphones Good Enough? All of the pocket and hand-held units have integrated stereo microphones. (Some even have more than two mics.) So, why aren't these built-in microphones good enough for you? There are several reasons why you might wish to upgrade. 1. Handling noise. Holding the recorder and pointing it at your source leaves you vulnerable to noises transmitted through the body of the recorder. This can be reduced with a grip, screwed to the tripod mount under the recorder. I've used a padded tripod, of the type pictured above. This cost me next to nothing at a local supermarket chain. A better solution would be some sort of a cradle or mount specifically designed to reduce vibration. But if you're going to all that trouble, it's no doubt easier and more ergonomic to put microphones on a grip and keep the recorder at a distance. A cable between the mics and the recorder means you are free to use the buttons and faders without any handling noise. Though touching the mics is another matter! 2. Distance to the source. Sound pressure decreases inversely with distance, so the number one way to get a louder, clearer signal is to get closer to your source. This reduces the amount of recorded reverberation and other extraneous noises. If you are conducting an interview you want the mic in close proximity to your subject's mouth. 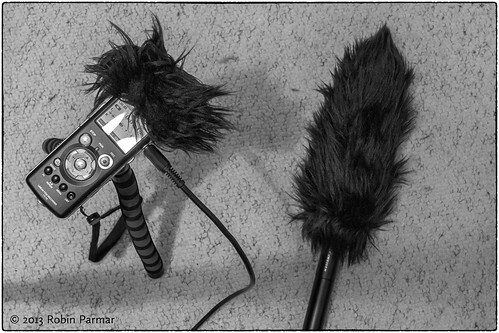 If you are hunting for bird-song, you want the mic close to the avian subject. Even if you are gathering location soundscapes it is good to reduce sounds from "off-stage", depending on how you wish to define your area of interest. Having microphones on cables means you can stay at a moderate or even very long distance from them, if needs be. 3. Being inconspicuous. You can't hide a recorder in plain sight if you need to use the microphones welded to the end. But it's a lot easier to hide microphones; some are even designed to be hidden -- useful for concert taping. Nature recordists also benefit from being able to position microphones and then move off into the distance, so as not to disturb the creatures they are interested in. 4. Audio quality. The microphones that come with recorders cost a fraction of the price of external microphones, and cannot be expected to achieve the same fidelity. Benefits to an external mic include reduced self-noise, improved ability to handle high SPL (volume), lower distortion, flatter frequency response, improved low end, and so on. 5. Improved sound stage. The mics on a portable recorder come in a fixed topology, separated by no more and no less than the width of the device. It might well be advantageous to position the mics further apart, so that you can get an improved stereo image, that is, greater definition between left and right channels. Manufacturers recognise this issue, which is why some recorders have "extra wide" settings or some such trickery. Don't get me wrong; when used moderately these effects can make a decisive improvement, but they are effects (involving mid-side processing or delay/phase tricks). Better to get it right in the first place. It is also true that certain recorder models have microphones that can pivot out to support wider separation. But this is still very much limited compared to the possibilities afforded by external microphones. 6. Pick-up pattern. Sometimes you might want a shotgun microphone to "zoom in" on a sound. Other times you might prefer a pair of omnidirectional mics to get a low-noise lifelike soundscape. Or a pair of cardioid mics for some sort of a crossed configuration. Or... Well, there are lots of choices, and being a good recordist is about using these well. I can be reasonably confident in claiming that for any given task, there is always a better choice than the built-in mics. But sometimes you don't want to carry around a larger rig. Sometimes you need to use the tools at hand. Or you might not have the funds to spend on various expensive microphones. Often the built-in mics might indeed be "good enough". I know they often are for me. At this point I will assume that you have a small recorder and have found certain limitations when using the built-in microphones. The next article will present an overview of the different types of microphones and how we need to power them.